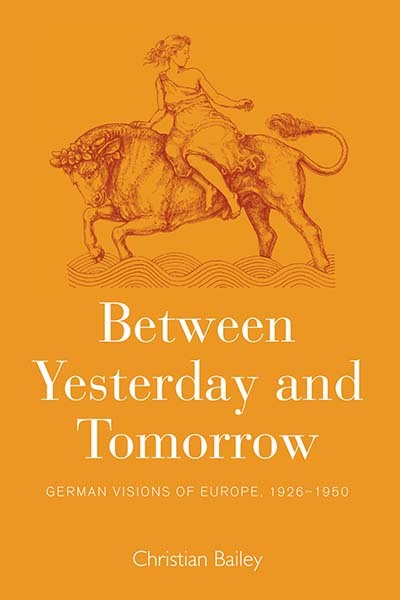 In Between Yesterday and Tomorrow: German Visions of Europe, 1926-1950, published last month, author Christian Bailey seeks to understand how Germans became such “good Europeans” after 1945. Whereas many histories of European integration tend to largely focus on the diplomatic goings-on between elites, this book focuses on how support for a united Europe was cultivated in civil society. Below, the author and his colleague Benno Gammerl share a dialogue about Bailey’s recent volume. Benno Gammerl: Your book convincingly challenges what one could call the negative founding myth of post-1945 European integration. According to this well-established narrative the European Union ultimately resulted from the wish to once and for all prevent falling back into the perils of fascism and total war. You highlight earlier visions of Europe instead that date back to the interwar period and that have at times commanded much wider popular support than the let-us-avoid-our-earlier-mistakes-rhetoric. Which positive aims and motivations sustained these European projects? Christian Bailey: Yes, it’s an interesting question as the interwar period often features as the darkest period in a dark half-century in Europe. Of course, we know quite a bit about positive interwar attempts at Franco-German reconciliation. The Briand Plan is often seen as the high-point of this kind of rapprochement that sought to pool European industrial and military capacity and thus to increase European prosperity and to take war-making capability away from national actors. Focusing on such initiatives is still important: it challenges us not to let the shadow of what happens after 1933 obscure the optimistic hopes of those who had fashioned a kind of modus vivendi in Europe by the late 1920s. Moreover, we need to reflect again on interwar plans such as the SPD’s Heidelberg Programme of 1925, which was an attempt to adapt Marxist internationalism: to steer a course between international revolution and domestic reform and to make sure that a durable social democracy could be built via parliamentary democracy. What I find more challenging in your question though is the implication that interwar plans for European unity that looked to retool earlier forms of pre-democratic supranational structure were not altogether discarded after 1945. I think this suggestion is largely right and it’s something I try to argue in the book. Certainly, the First World War’s losers such as aristocrats and military leaders may have ended up being pro-fascist as a result of their determination to overturn Versailles and “mass rule.” Yet, this doesn’t mean that all Europeanist critics of interwar democracy and national self-determination (including those from the Right) didn’t have more positive counter-models to offer – models which continued to be influential after 1945. For instance, they looked back to the organisational arrangements for the Austro-Hungarian Empire and saw within them not just as a means of propping up an unfeasible, crumbling empire. Instead they recognised in them a genuine attempt to grapple with the competing claims of nationalist movements and minority rights and to develop channels for political participation that would embrace the different peoples of the Empire. I think such Cisleithanian precedents for creating a multi-layered local, regional, national and supranational administration were taken more seriously after 1945 than we might recognize today. What’s more they should be taken seriously by historians today; it’s too comforting and easy to write off everything about “pre-modern” empires and to imagine that the post-1918 settlement in Europe would have worked perfectly if only it hadn’t been for the extremists. BG: How, with which methods and sources did you manage to grasp the interactions between these concepts and ideas on the one hand and the lived experiences of common Europeans on the other that you highlight in the introduction? CB: Well, I should probably say that if readers look for the life of “Joe European” in my book then their hopes will probably remain frustrated. Having said that, while the Europeans I profile may not be altogether common Europeans, they are individuals who experienced Europe and Europeanization not just as ideas but as lived realities. They traveled (and spied and sometimes fought) across borders, read, wrote and translated works in a variety of European languages, and exported and imported ideas, habits and norms as they moved around. As for my methods and sources: I tried to focus on groups whose existence and output can tell us not just about ideas of Europe but also a good deal about the media and political cultures in (but also beyond) interwar and postwar (West) Germany. For instance, the opinion-formers in the media in the early postwar years were the subjects of patronage and censorship from a variety of international overseers. The former were highly mobile and often had recent exile experiences that they worked through in their writings and broadcasts. Similarly, by focusing on groups that sought to be active in the party political sphere, I was concerned with individuals who weren’t just Euro-enthusiasts but sought to have a broader impact on the reconstruction effort and the revival of democratic life in West Germany and Western Europe. In terms of sources, this meant not just following keywords or exclusively European themes or events but reading the output of publications and organizations which concerned themselves with European questions as only one dimension of broader political issues. BG: What role do colonial models play in your narrative? They could also be viewed as enabling the integration of different parts into a hierarchical political entity. Yet the colonial question in its global dimension is somewhat conspicuously absent from your analysis. Why is that? CB: This is really a good question and I did think about this issue quite a lot while researching for the topic. Yet, although some of the European visionaries with whom I deal discussed, for example, what sorts of colonial protectorates an integrated Europe would oversee, such a colonialist (or perhaps post-colonial) perspective was not really typical. What was rather more typical was a sense that Europe was destined either to be a unified entity or to become a colony. Certainly some of the socialists featured in the book started to talk of Europe as part of the ‘Third World’ as early as the Second World War years. They either saw European nations as classical Marxian vanguards in a global revolution or rather believed that non-European resisters of global imperialism would be able to teach Europeans strategies for dealing with the new Soviet or American “empires” that would make them merely the youngest of the colonial peoples. But generally, the point I’d like to stress is that for pretty much all the groups I profiled, the focus on European integration wasn’t so much about these individuals gaining an enlarged political field of vision as them limiting themselves to a narrowed one. By that I mean: many of the groups saw their focus on European unity as being a more realistic attempt to solve localized problems than something global like the League of Nations could do. Moreover, many of the individuals featured saw the writing on the wall for European empires and recognized that Europeans had little to export beyond European borders except their troubles and anxieties. BG: The title of your book “Between Yesterday and Tomorrow” invites a host of questions about temporality. These are further provoked by your opposing conservative understandings of Europe as – to use the vocabulary of Saint Paul and Carl Schmitt – katechon against capitalism, socialism and nationalism on the one hand and progressive concepts of Europe as catalyst for peace, prosperity and democracy on the other. Furthermore, the concepts of religion and revolution, frequently mentioned in your book, also hint at a combination between retrograde prefixes and eschatological outlooks. Now allow me to ask the question about the in-between tense: What combination of forward looking hopes or fears and backward looking nostalgia or contempt shapes present-day German visions of Europe in your opinion? CB: Well, I think the default setting of most European leaders is to look forward and to always hold out the hope of a more unified, more prosperous, more dynamic European Union. But there certainly is an element of nostalgia for the early postwar era in many of the rhetorical justifications of European integration. As Martin Schulz, the former President of the European Parliament put it, present-day states(wo)men feel like the later generations in the Buddenbrooks novel – they’re aware that they might be squandering the remarkable inheritance that was built up through the heroic hard work of the first generation of postwar leaders. On the one hand this perspective seems outdated – the European community that is or isn’t being built at present is a much more complicated phenomenon than the Europe of the Six. However, the belief that Europe isn’t just a geographical entity or an ideal-type but some sort of destiny or telos does of course encourage the kind of long-term thinking that brings Europeans back to the negotiating table even at times when the numbers don’t seem to add up or national publics don’t seem to be clamoring for continued integration. BG: And the ultimate question: if life was a tape recorder, how would you describe your task as a historian: press rewind or fast forward? CB: Hmm, I’m not sure if I’m answering your question but I always come back to the famous Benjamin/Klee image of the angel of history dragging individuals upwards and away from the past while they are facing backwards. At least in the case of this book, I’ve certainly tried to approach the topic of European integration history not so much by looking forwards (or turning my actors around so they’re looking forwards) but by trying to show how individuals mostly looked backwards even if the historical movement of which they were a part did move forwards (I guess I mean in the political and maybe even moral senses of the word as well as the obvious temporal) from the interwar period to the post-Second World War era. Christian Bailey is a lecturer in history at The Open University and at Balliol College, Oxford. After having completed his PhD at Yale University, he was appointed Max Kade Fellow at the Free University in Berlin and has worked as a postdoctoral researcher at the History of Emotions Research Center in the Max Planck Institute for Human Development, Berlin.